embark upon the 2018 winter games! If you didn’t get up in the wee hours of the night to watch the opening ceremony of the 2018 Olympic Games in PyeongChang, South Korea, you’ll have the chance to join in on the ancient tradition this evening! 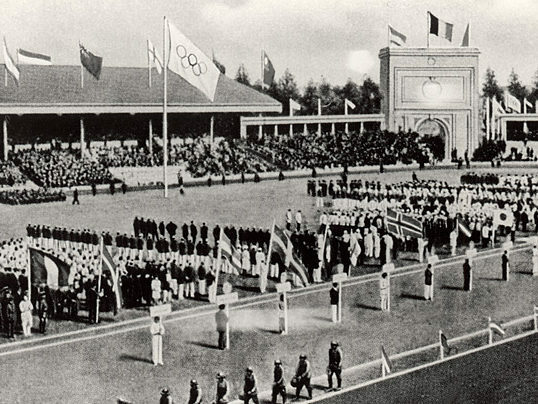 Ceremonies have been an integral part of the Olympics since the earliest games in ancient Greece, when the start and finish of each game were marked by a celebratory feast, song and poetry. While rooted in the tradition of those first Greek games, modern Olympics feature elaborate opening, closing and medal ceremonies—with opening ceremonies showcasing the host country’s culture, history and importance to the global community. Today, we’re exploring how Olympic ceremonies have evolved since the first modern Olympic Games in Athens were held in 1896 and highlighting some of the historic ceremonies that laid the groundwork for the global spectacles we enjoy today. 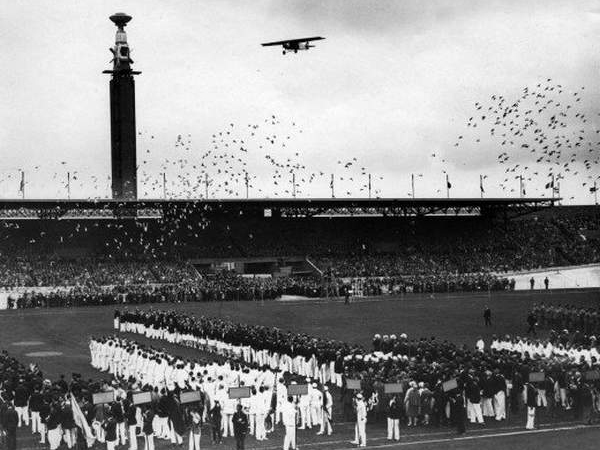 Hosted in a city still reeling from the destruction of the first World War, the Olympics in Antwerp were marked by a commitment to peace and unity by all participating countries. For the first time, an athlete from the host country read an oath on behalf of his fellow competitors to play fairly. The Olympic flag—comprised of interlocking rings featuring at least one color from every nation’s flag—also made its debut, representing unity. Live doves symbolizing peace were also released for the first time, a tradition still present today through a symbolic dove release (for the safety of the doves!). Paying homage to the ancient tradition, the first modern Olympic flame was ignited for the first time, burning for the duration of the games. The flame was lit in a cauldron at the top of a tower in the stadium, designed by renowned Dutch architect Jan Wils. In 1934 the International Olympic Committee approved of the idea of reconnecting the games to their roots by transporting an Olympic flame lit in Olympia, Greece to the modern Olympic games—which would be held in Berlin. 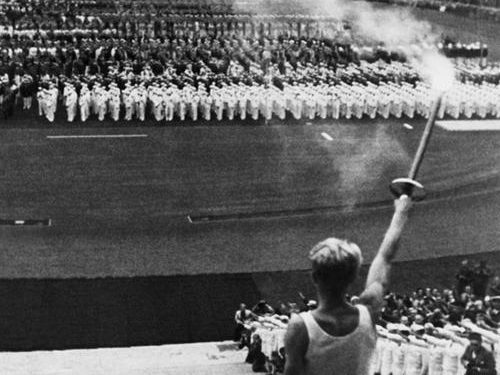 Despite the controversy surrounding these particular games, with Adolf Hitler at Germany’s helm, the inauguration of the torch relay created a cherished new Olympic tradition. 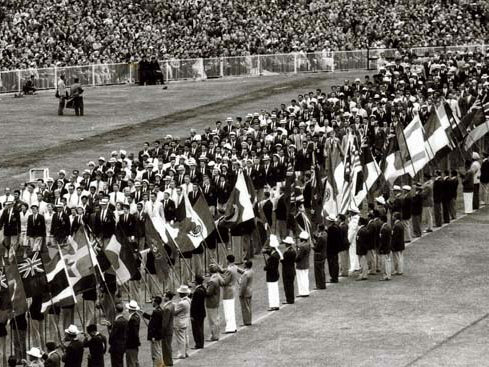 The 1948 London Olympics marked the end of a 12-year hiatus, due to World War II. Similar to the 1920 Olympics, the host city celebrated its resilience while continuing to face the harsh aftermath of war. 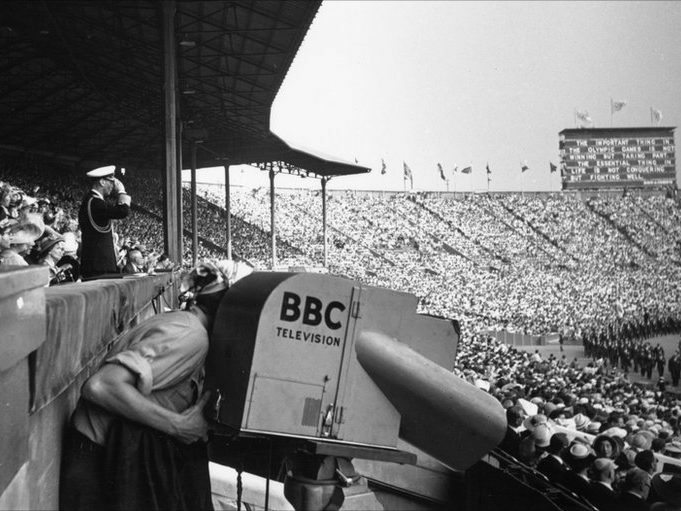 This opening ceremony (and the games that followed) were broadcast live on BBC TV for the first time, allowing the ceremonial themes of peace and unity to spread beyond the walls of the stadium. Three days before the closing ceremony in Melbourne, President Avery Brundage is reported to have received an anonymous letter from a teenage resident including words that left a lasting impression: “Let there be One Nation. War, politics and nationality will be all forgotten, what more could anybody want, if the whole world could be made as one nation.” The President changed the rules of the Game, allowing all athletes to come together—regardless of their origin—and march together at the closing ceremony as a global nation. True to this tradition, athletes enter the games with their country and exit the games with their fellow competitors from around the globe. And the evolution continues. Olympic ceremonies—particularly those marking the start of the games—have continued to grow in size, scope and production quality over the years. To gear up for tonight’s airing of the 2018 ceremony, revisit the colorful productions of recent years on the opening ceremonies page on the Olympics website. As strong proponents of community-building through the arts, we’re thrilled to see hundreds of millions of people across the globe tune in to learn about a culture through music, dance and storytelling. Olympic opening ceremonies are filled with hope, possibility and the reminder that we’re part of a larger global community with more similarities than differences. Despite our age, country of origin, ethnic and cultural background, or socioeconomic circumstance, we all take pride in our home countries and carry the hope that the hard work and discipline of our athletes will be rewarded. We look forward to tonight’s full coverage of the 2018 opening ceremony, ‘Peace in Motion,’ and the winter games ahead! This entry was posted in Beyond Levitt, News and tagged Olympic Games on February 9, 2018 by Nicole McGaffey.